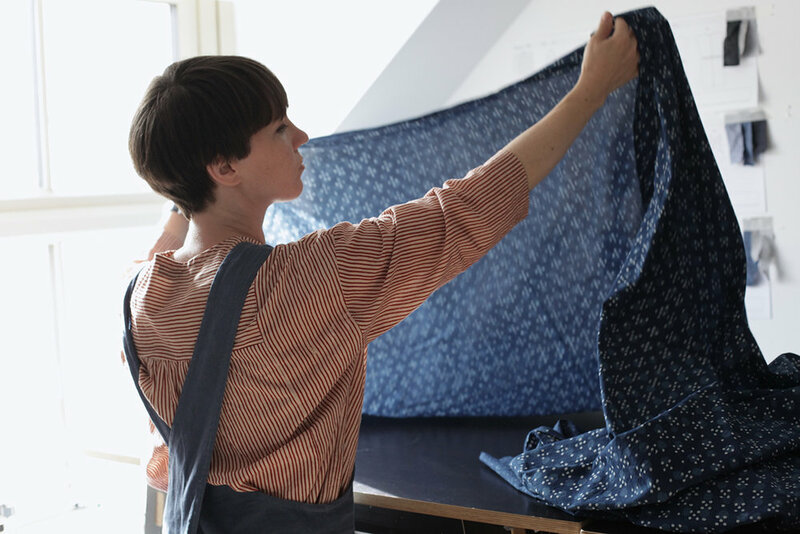 Last month I had the pleasure of speaking with one of my favourite sewing brands Merchant and Mills, about sewing, inspiration and daily life. I hope you enjoy this special glimpse behind the scenes of Nadinoo. How did Nadinoo come to be, what is your background? I set up Nadinoo in early 2009 as a way to get back to the hands on process of designing, pattern cutting and stitching a garment. I had just left my Apparel design job designing performance wear for Puma in Germany and desperately needed a change. The industry after the recession began to feel very strained with plenty of redundancies and much more profit focused than earlier in my career. I knew I needed a way out so I could be creative again and expand on the skills honed at university, which I was no longer putting to use. And so I started up Nadinoo in my attic studio with a final pay packet and the decision to keep things small with low overheads, allowing business to grow organically with the demand. Designs were simple and playful, stitched in Liberty’s classic cotton prints which most people already knew and adored. This simple formula of up beat handmade designs was very well received and bloggers were generous with their love and support. The style and fabrics have evolved and grown up with me in the years since, but the philosophy and ethos is very much the same. I am still a part of every process and feel fortunate I have been able to continue doing what I love all these years on. How does a collection start, where do you draw your inspirations from? I’m usually already thinking about where to take the next collection as I’m finishing the last one, not that I’m in any hurry but it’s nice to see a new direction emerging and evolving from the last. This can begin with a simple design concept pulled together through mood evoking imagery or a selection of textured tonal fabrics that tell a story. I don’t work to any calendar or seasonal drops which I find quite freeing, instead I design and release our clothing as they are ready and the timing feels right. The Simple wear collection was heavily inspired by the minimalist movement, the idea of owning less but mindfully selecting those items so they do more for you. I wanted to translate this into the garments I made so each piece would be sturdy enough to endure daily use and be worn in different ways with your current wardrobe. This also overlapped with my desire to design clothing to suit all stages of womanhood to eliminate the need to purchase a new wardrobe for our changing bodies through pregnancy and beyond. This certainly influenced the shapes I chose with looser silhouettes that drape and adapt to your current needs. These silhouettes were hugely inspired by simple Japanese style and detailing, which has always been a bench mark of taste for me. I have yet to visit to Japan but I know the day I do my mind will be fit to burst with ideas..
What comes first, the pattern or the fabric? 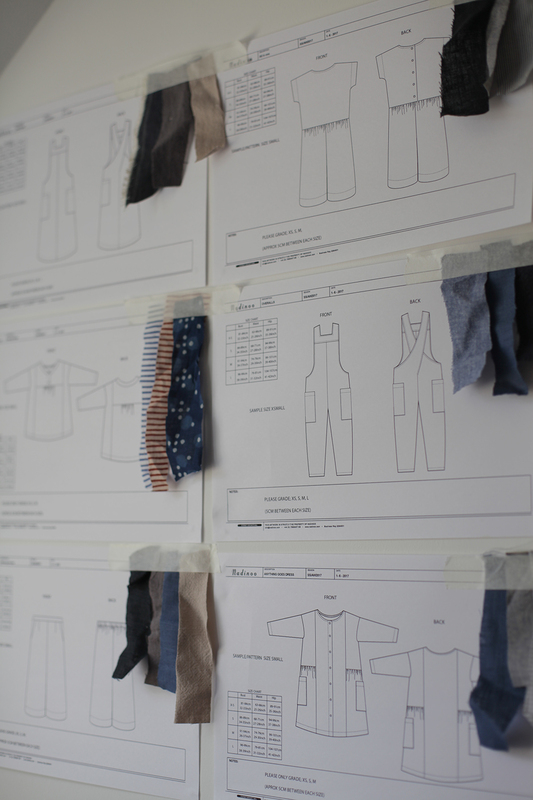 For me it’s almost always the fabric, I feel there is something special about starting the design process this way. The hand feel, texture, weight and drape of the fabric can dictate the design and silhouette, almost narrowing your options until you figure out the perfect silhouette to flatter and show off your chosen fabric. I do love however, when you have a design that translates into a totally different garment when the fabric is changed, I’ve started to experiment more with a verity of fabrications in the same design, allowing the garment to change it’s function along with the fabric it’s stitched in. What do you look for when choosing fabrics for your collection? A lot can depend on the concept or colour pallet I have in mind but I like to keep an open mind. I prefer to work with 100% natural fibres, usually wovens as this is my specialty. I’m a sucker for a fabric with a good story; hand woven, hand printed, organic fibres, anything that gives the garment more life and meaning. For the Simple wear collection I wanted to source complimenting fabrics that could be styled easily with the rest of the collection, I still wanted there to be a story of print and texture even if the colours were tonal and muted. I’m always inspired when it comes to fabric sourcing and try to push the boundaries and try something new with each collection. You make everything in your home studio. 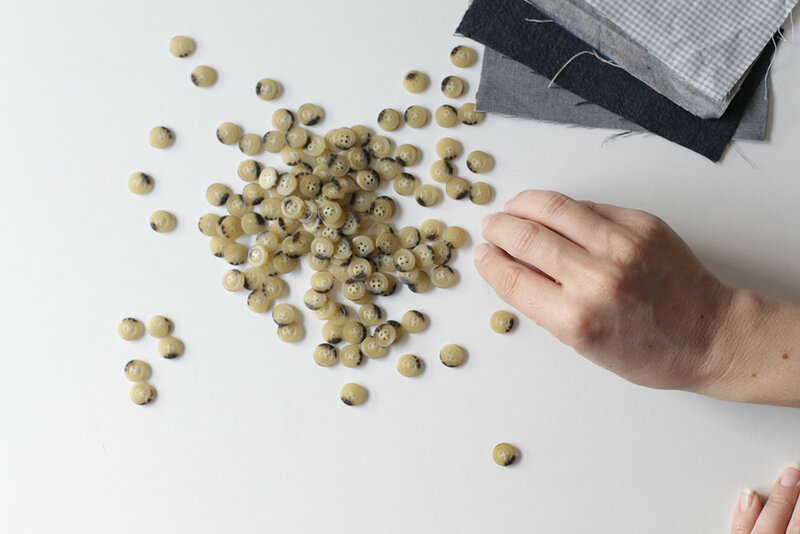 Do you have a favourite part of the making process? Yes, currently I sew everything from our home studio, it’s not a big space but right now it’s quite handy to be able to nip in and out whenever I need to. Choosing my favourite part of the process is tricky as I truly love all the stages. Pattern cutting new ideas can be massively exciting as you see your 2D sketch become a 3D garment. Or photographing the collection after all the hard work and seeing the concept with the styling brought to life.. But I think I get the most joy from seeing a garment reach the final stage, where it turns from fabric and thread into a finished piece of fictional clothing. I still get giddy when I reach the trimming stage and can reflect on the process the garment has been through. 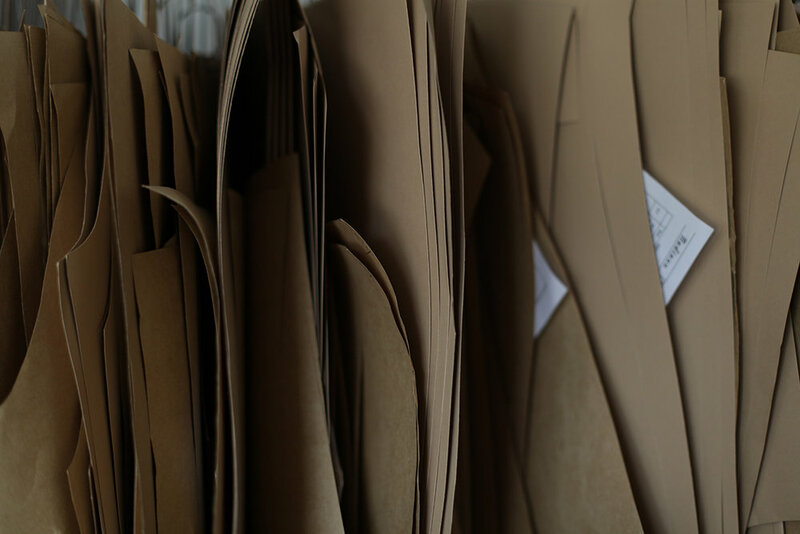 As a small business what, if any, obstacles have you come across when sourcing fabrics? Nadinoo is still a tiny business with only a handful of each design reaching the wearer so it’s quite tricky to find suppliers who will trade with low minimums. This is one of the great advantages of purchasing fabrics through Merchant and Mills as you get to test the market with a 10 meter roll to ensure it’s right, low risk with less chance of wastage (WIN!!). For me it’s also about finding nice and decent suppliers who care about the quality of their products and the manufacturers and mills they work with. Always a bonus if they are keen to help small independents as well as their larger (higher volume) customers. For Nadinoo the fabrics are our biggest outlay so I want to make sure this money is invested in companies I believe in who share the same ethos and love for the craft. What does a typical day look like in the Nadinoo studio? I keep irregular working hours in order to get extra time with my two young daughters. Working from my home studio means work can happen at any time. Most days I start around 9am when my youngest goes down for her morning nap. I make myself a cup of tea and sit at the computer to tackle my inbox, order any needed fabrics/trims and other regular boring admin jobs… Then I get cracking in the studio, cutting and sewing my way through the latest orders. As most of our styles are made to order and sometimes have special requirements, I try to group similar designs and fabrics together to work more efficiently. While working I keep an eye on social media to post relevant news and respond to customer queries that might need my immediate attention. I’ve always got the radio on BBC 6music playing in the background to keep me laughing, dancing and generally entertained. I’m usually taking notes from things I hear on the radio or pinning imagery on social media, my mind is constantly piecing things together for a variety of projects and plotting what is next for Nadinoo. I break for lunch when my daughter wakes and we have a couple of hours play together where I get to switch off and just be a mama before dropping her off at nursery for the afternoon. Afternoons are spent continuing and trying to complete any tasks started in the morning, if the weather is nice I might grab 5-10 minutes in the garden with a cuppa and a good book or magazine to recharge and be inspired. My days in the studio usually fly by as I charge through my lists, I’m a sucker for getting a job done just so I can tick it off. I like to finish the day with at least a few orders completed, ready to pack and post at the village post office before collecting my girls from school and nursery. It’s a busy day with plenty of multi-tasking, but I’m sure it’s the same for all mothers. What made you decide to not out source production of your collections? Currently we only sell through our online store so demand does not meet most production minimums, but I like that we are able to be responsive with our made to order service and adapt orders to suit customers’ needs. I would be sad to lose the personal service we offer should we go down the production root and the unique relationship we have with our customers. I’m also conscious of reducing our waste and only sewing what is needed, so right now in-house production feels right. One day though if we return to wholesale, it would be great to find the perfect UK factory to help with production. So do get in touch if you know of the perfect factory for Nadinoo! How does social media play a part in your business? With Nadinoo being an online store social media has always been crucial in the day to day survival of the business, especially as advertising is not an affordable option at this stage. In the early days of Nadinoo our blog was the main place to go as the blogging platform was invaluable at getting the word out. Social media trends have of course changed over the years and now it’ s much more centred around Instagram. it’s a platform I enjoy being a part of and have to say has improved the connection I can have with our audience. That instant feedback from social media is great to have and also a wonderful way to get people talking about issues or topics that are relevant and important. I still find it mind blowing that you can connect with a whole community of like minded people from around the world with just an app. 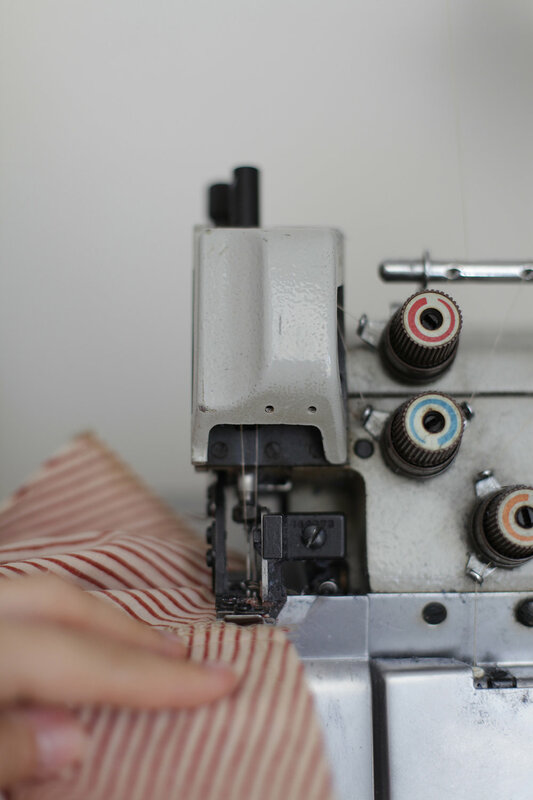 Do you ever get time for personal sewing, what are your favourite type of projects? I have to admit I’ve only ever made a handful of garments for myself since setting up Nadinoo, but as I design each collections to satisfy my own taste and needs I luckily end up with a whole wardrobe of samples to pick and choose from each day. I have on a rare occasion set myself a challenge to design and sew a garment while my youngest is taking a nap. The results can be quite surprising as I usually go back to my early love of experimental pattern cutting where I throw out the rule book. It’s something I should definitely do more of as it’s quite inspiring and freeing to design just for myself, without the quality constraints or end customer to think of. Like most seamstresses I have a huge selection of beautiful fabrics I purchase with grand plans of making myself something special, it may be time to dig them out and have a play.